Window treatments are essential in a bedroom since they add privacy, make it easy to adjust the lighting, and help maintain a steady temperature. There are many different types of window treatments, however, so it can be confusing to choose the right one. To help you decide which type is best for your room, here is a list of basic window treatments along with a photo of each. Curtains are one of the most common types of window treatment used in homes. They are especially popular in the kitchen, although they are also frequently found in the bedroom. Curtains are available in many different styles, colors, and patterns, making them an easy way to add a shot of color and pattern to your room. Typically, curtains are made of lighter weight fabric than drapes and are sold in packages containing two panels. They typically hang from a curtain rod, or curtain rings attached to a rod, which is installed anywhere from just above the window frame to a few inches below the ceiling line. Since curtains come in many different lengths—to fit basic window measurements—there are several ways to hang them, and several ways to tie back the panels, as well. Some methods include puddling the curtain panel on the floor, basic right or left tie-back, and cascading. 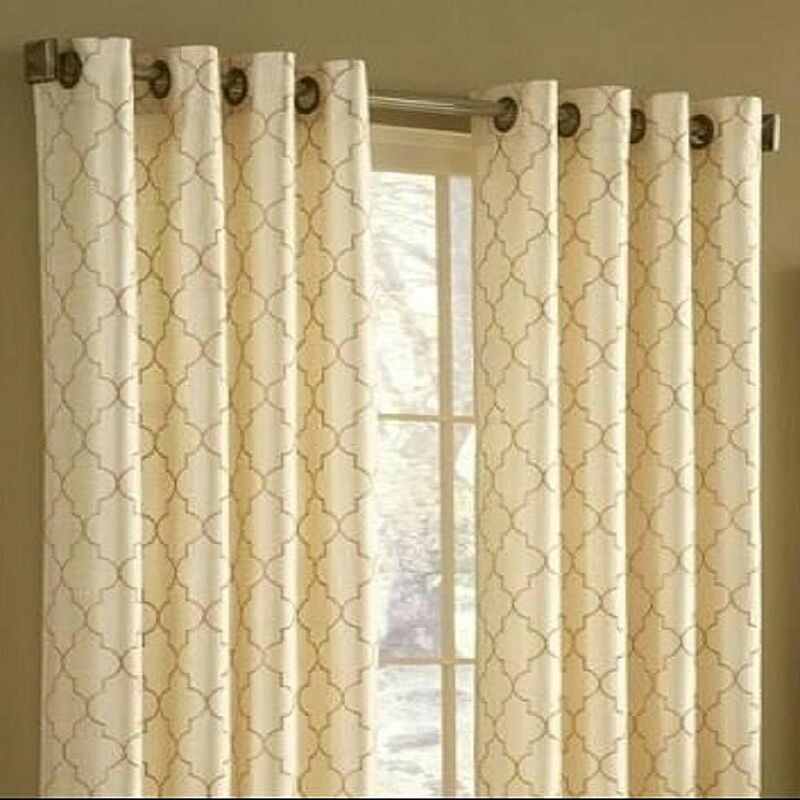 Drapes are similar to curtains—sold as panels of fabric with many different lengths, colors, and patterns—but are normally made of heavier fabric, lined, pleated, and hung on a traverse rod with a string or rod pull so they can be easily opened and closed. Drapes are more formal than curtains and are used in many rooms of the house, including the master bedroom, living room, and dining room. Designer Tip: Having trouble sleeping because your room is too light? Blackout drapes - they have a heavy lining that blocks out all light—are a great solution for not only keeping out daylight but also blocking cold drafts or heat from leaking through the windows. As the name suggests, sheers are lightweight curtains made from sheer fabric. They add a dose of dainty charm to a bedroom but don't provide privacy or block out light, so they are typically layered over a blind or shade. Sheers are a nice choice for a small bedroom, as their gauziness gives the room an open, airy feel. They are especially popular in cottage, coastal, and country rooms. Shades are one of the most popular types of window treatment throughout the home, thanks to their nearly endless range of styles, colors, and patterns, and also because they work well with just about any decorating style. A shade is basically a length of fabric or a similar material, cut to the width of the window, and attached to a rod or frame that allows the shade to be lifted up and down with a pulley or roller system. There are many varieties of shades, including bamboo, cellular (translucent), Roman, pleated (shown here), solar, motorized, balloon, and roller (the most basic type). Blinds are simple, modern window treatments that are wonderful for bedrooms because they add privacy and do a good job of blocking out sunlight. Blinds are made from hard materials, such as wood, metal, or vinyl. They have slats or louvers, which are tilted open or closed by cords running through the length of the blind. The entire blind can also be lifted or lowered. Blinds are typically hung horizontally over smaller windows, or vertically over a sliding glass door or very large window. There are many different styles of blinds, as well as many different colors. Shutters are an old-style window treatment that although not commonly used in the bedroom, do look wonderful in a coastal, cottage, country, or rustic room. They are typically made from painted or natural wood, although faux wood is another option. Shutters are fitted within the window frame and have hinges that allow them to swing open or closed. They also have small louvers that can be open and shut with a lever to filter the light. You'll find shutters in a wide range of colors, although white and natural wood tones are the most popular. Valances are decorative top treatments used with drapes, curtains, shades, or blinds to conceal the mounting hardware and also add a touch of color or extra pizzazz. Basically, valances are swathes of fabric draped around the top of a window frame. Their many styles include pleated, arched, gathered or flat, straight or shaped, and mounted on dust boards, poles, or rods. Due to their dramatic effect, they're normally found in formal rooms, such as master bedrooms, parlors, or dining rooms. Swags and cascades are popular top treatments that add a touch of dramatic elegance to a window. They are forms of valences, and as such, are layered over another window treatment that provides privacy and blocks light. Swags are typically draped over a horizontal rod in folds. They might match the underlying window treatment, or more often, add a contrasting dose of color or pattern to enliven the room. Cascades are lengths of fabric that either drape down the sides of the window in a zigzag of fabric, or puddle across the top of the window. They can be used underneath or over swags, curtains, or shades. Cornices are formal window treatments that are typically made of wood or similar hard materials. A cornice is shaped like a box and fitted over the top of the window frame to hide the mounting hardware for the underlying window treatment. The cornice's wood might be left natural; or painted, covered with fabric, padded for extra texture, or even covered with wallpaper. The bottom of a cornice can be shaped and trimmed in many different ways, and some homeowners opt to have their cornices custom-made to match the material of their furniture. Valances, Swags and Cornices: What's the Difference Between Them?